Welcome to Altenew Artist Marker Refills blog hop! I love Altenew Artist Markers and am so happy they released the refills for them. I can get more out of the artist markers now. Artist markers are alcohol based markers, that means the refills are alcohol based inks. So I decided to treat them as alcohol inks and make gorgeous backgrounds using them. In this blog hop I have a video tutorial on how I made one of the cards I am sharing with you today. Hope you enjoy it. If this is your first stop, then do not worry, I will list all the participants of the hop towards the end of the post. If not, you should have come from the very talented Erum Tasneem’s blog. Your next stop from here will be to the gorgeous talented Therese Calvird. Here are my first project for the hop. 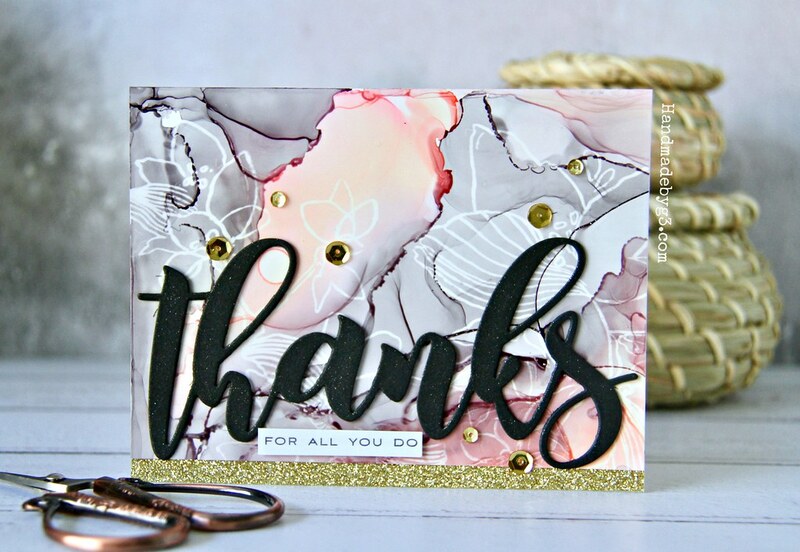 I created the beautiful background on this card using just two of the Artist Marker Refills. Below is the video on how I made this card. This card can be used either as a portrait version like show above or landscape version like shown below. I also used the Alcohol Lift ink to get subtle interest on the background.The subtle stamped image does not take away the beauty of alcohol ink background using Artist Marker Refills. Here are some closeups of the card. I then created another background using Frayed Leaf, diluted Jet Black and Sea Glass artist marker refills. Using this panel I created this card below. I trimmed the background panel and adhered it behind the negative Hang In There die cut panel so the refill background shows through the negative space of the die cut. Then with the rest of the background panel, I die cut the leaves and two layers of the Fantasy Floral die cut to make two clusters and adhered it on top and bottom of the card front. 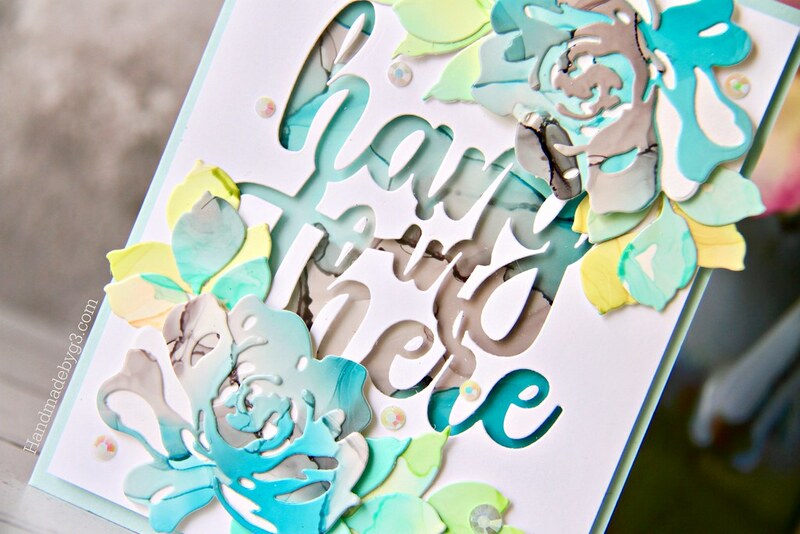 The base layer of the flowers are just white cardstock die cuts. The white helps the alcohol ink second and third layer pop more. I tossed between adding the jewels or not for this card. I cannot not add anything because the card looked a bit naked without the final touch. So I went ahead and added the jewels. Here are some of the closeups of the card. I am in love with the backgrounds using artist marker refills. So pretty especially with the lighter colours. If you want to bright colours, then just choose the darker shades of the refills and make the background. Hope you enjoyed my video and got inspired by my projects today for the blog hop. I have listed all the supplies used to make these cards below. Now there is no hop without prizes. I am also giving away $20 gift certificate. The winner will be chosen randomly from the comments below. I will announce the winner on my blog on 26th of September 2018. Here is the list of all the participants in this blog hop. Hop along and get inspired. As part of the blog hop, Altenew is having a promotion on their Artist Markers. Your next stop is to the gorgeous talented Therese Calvird. I am blown away by your backgrounds and how soft they are! 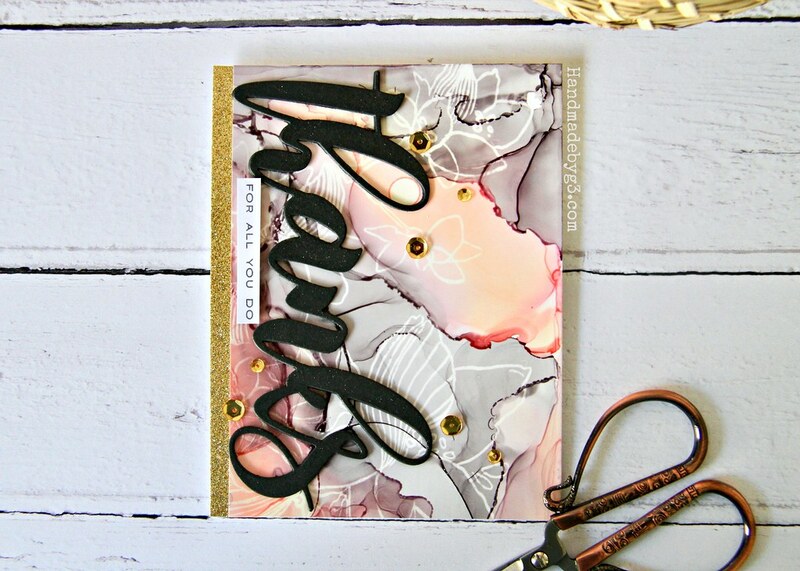 You transformed them into beautiful cards…thanks for the tutorial!! Wow wow wow! I absolutely love the soft and feminine look you created for both cards, with the different colour schemes. Just stunning! Oh my goodness! I love these two cards. I definitely have a huge affinity towards alcohol ink backgrounds. 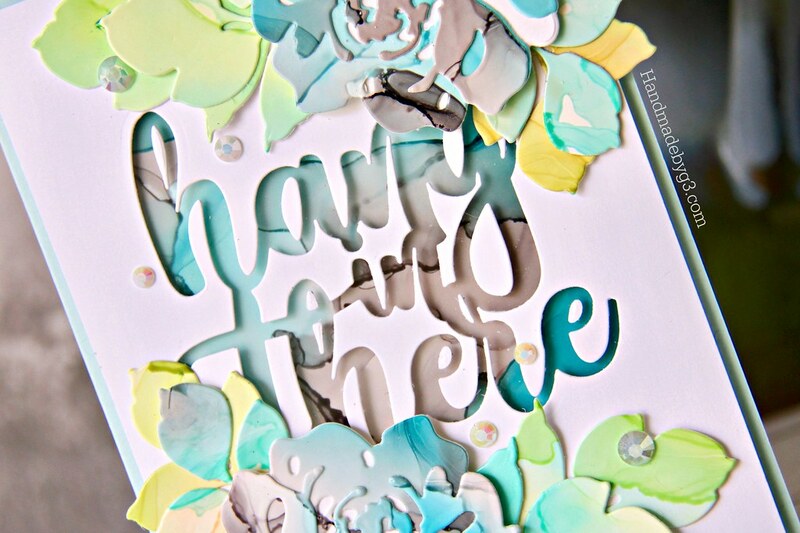 I love love love the way you did the first one… the colors are soft and pretty and I love the way the alcohol lift ink worked with these colors! Gorgeous. And I love the dimension and colors on the 2nd card too! Just stunning! The abstract background is perfect for the alcohol lift ink of the fish. The hang in there die is perfect for how I feel sometimes! Just lovely. Flowing, organic designs! So many great techniques can be done with alcohol inks and these are just fabulous. So unique and creative. Can’t wait to come back and watch the video. Beautiful! So many ideas swimming in my head! Lovely cards, so soft and feminine! Very creative! Wow, stunning cards! Absolutely gorgeous backgrounds and you’ve showcased them so beautifully in your card designs. Such a beautiful technique. I need to get some Yupo paper for this one. Gorgeous cards. WOW! That alcohol ink background is gorgeous! I love the soft colors even though you used black! Thanks for the great inspiration! Both of these awesome jewels are wonderful! I love both stunning backgrounds & will be playing with this technique soon. Thanks for the great inspiration? Your cards are so beautiful Gayatri ! Loved the BG on first card a lot ! Wow both cards are gorgeous and unique. I love that first one! Awesome background and I like that the first card can be landscape or portrait. I like how you used a background to create the flowers and leaves on the second card. Beautiful cards! Love the design and colors. Your cards are amazing! I never thought of using the marker refills in the same way I have used alcohol inks. Your choice if colors is beautiful. I especially like pink and grey together. Also I have to try using negative space in my cards. Thank you for sharing! Wow!!! 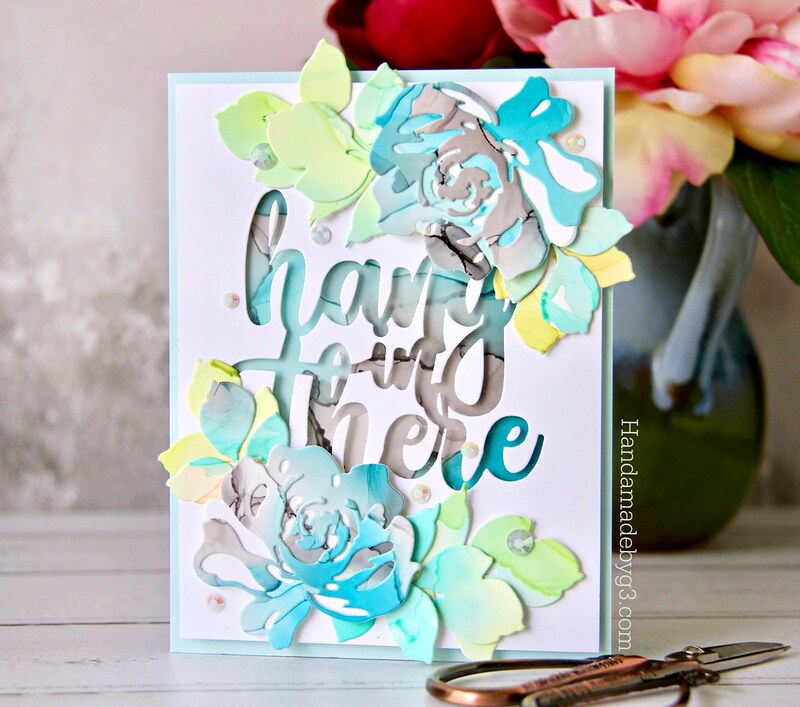 Both cards are beautiful, and while I normally gravitate to blues, I have to say that the gray and frosted pink, which appears as a soft peach, are just stunning!!! Thank you and have a blessed day. Two very pretty cards. Thanks for the video showing the first one. I love the way you used the refills. I probably wouldn’t have thought to use them for anything besides filling the markers! 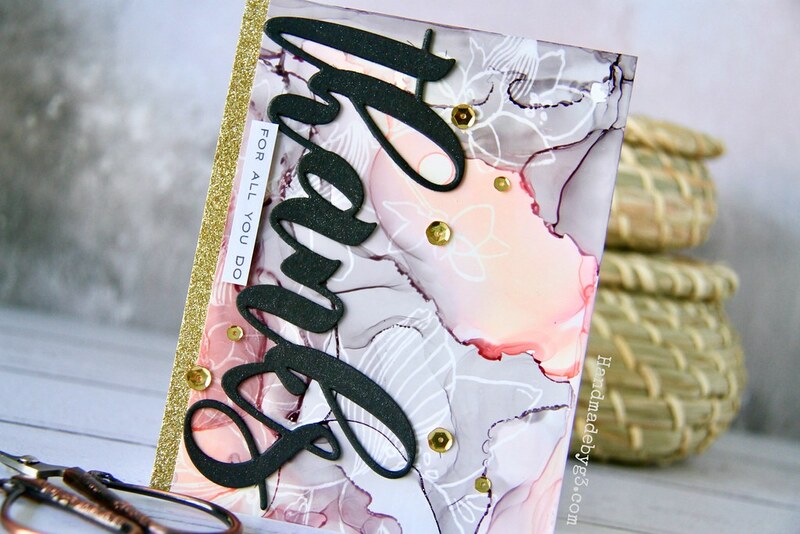 Both the cards are stunners..fabulous..and the tutorial is so informative for beginners like us thanks for sharing!! Love your cards Gayatri, my fave is the sideways sentiment, totally fab and funky! I love these! Such pretty backgrounds. Beautiful designs, too. Love the cards’ backgrounds. They helped to make two pretty cards. Gorgeous backgrounds Gayatri! Love all your cards, but the color combo and big die cut on the 3rd card just made my crafty heart skip a bit! Thanks for the inspiration! Both cards are beautiful. I love those color markers! I don’t know why I am so afraid to try tha alcohol markers… I think your backgrounds are so sweet they just might have given me the courage to try them!! beautiful cards, Gayatri – and so pleased these markers are available as mine are getting pretty dry. 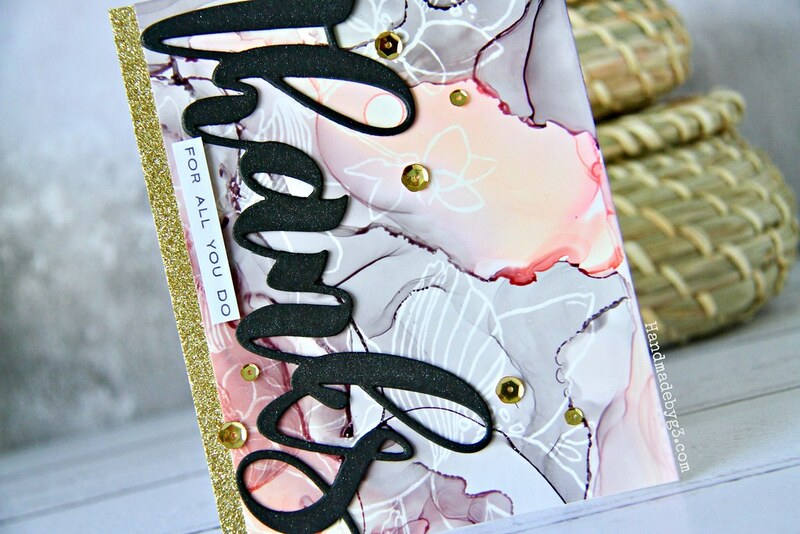 Both cards are gorgeous Gayatri – love that background on the “thanks” card – great color choices. Simply stunning!! I love the 3-D effect of your cards! The diecut technique is so cool! OMG! I am in love with the way you c elated both backgrounds with the ink refills.mi have got to get some of these a give it a try. And it was brilliant the way you used the alcohol like ft ink! Both cards are fabulous!!! What beautiful cards, very unique backgrounds! Your cards are awesome, love the colors you used. I am so excited about the new Artist Marker Refills, I can’t wait to get a few and start making some backgrounds and die cuts! Thanks for the inspiration today. OMG this are so beautiful! I love the colour combo of the first one and the second card with the colour on the die-cut flowers is simply amazing!! Your pink and grey background is so pretty! It’s like a fine marble. So interesting to see how you created grey from the black ink…I learned a lot from watching your process. I absolutely love the colors in your second card as well! Beautiful! These new refills are going to be so useful! Congratulations Shelly! 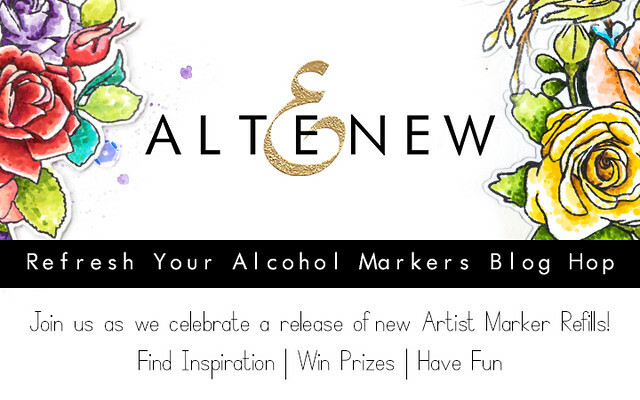 You are the winner of my $20 gift certificate.Please contact Altenew at winner@altenew.com with the subject line Altenew Refresh Your Alcohol Markers Release Blog Hop Winner from Gayatri’s Blog. Stunning Gayatri. Love the grey and pink together like this. Wow!! That grey and pink background was amazing!!! It looks so real!! You did an awesome job on that card, I love it!! Love your cars, so very elegant. Beautiful color choices. Th e gray marbeling is so unique. I also love the reverse cutout. these cards are so gorgeous! Love both of them. Your video was very nicely done, also. I love both of these beautiful cards, Gayatri! The blend of colors is really pretty, and I especially like how you used the die cut flowers and leaves along with the alcohol refills. It all looks brilliant! The cards are gorgeous. I particularly love the backgrounds how soft they are. Thanks for participating. wow thanks for sharing theses awesome cards!! I LOVE the ink resist technique. The color choice is beautiful. I watched your video, and you have so much talent applying and moving around the ink from the refill. I love how you used the ink refills! Such an elegant look! Your two cards are fantastic ! I specially love the colors of the second card (blue is my color). Thank you for the inspiration. Gorgeous cards! Love the marbled look of the background; very elegant. Thanks for sharing. I love your cards. Both are very beautiful! Love your cards . They are both amazing . Oh Gayatri, I simply adore your cards! I just placed an order which includes the Fantasy Floral dies and am so happy to see your post! Thanks for sharing all the details and the video. I can’t wait to try this! just amazed that these are the result of two and three colors, beauties! Those backgrounds (and cards) are stunning! Love the look of the negative die cutting. Great inspiration! Stunning use of the colors! Those backgrounds are amazing! Thanks for sharing. Really beautiful cards! So inspiring to a beginner with alcohol inks. That background on your first card is out of this world! The alcohol background is stunning! These cards are gorgeous! So glad I jumped onto this hop so I could discover you. These are so pretty, and that’s not a word I use often with alcohol inks. Vibrant, beautiful, yes, but not pretty. But you managed to make them so soft that I can’t help but use the word pretty. I’m surprised by how much I like the grey in the backgrounds; maybe that’s what has helped soften out the colors. I love what you’ve done with these cards. Thank you so much for sharing! Wow, I absolutely loved the first card. Thank you for the video on how to make it! Beautiful cards. Love the alcohol lift you did on first card and colors. Very nice! Love the marbling on the first card. Big, bold strokes of color. I don’t think I would have thought to use that color combination. I will have to keep it in mind. Beautiful card. P.S. The ‘share’ list to the right of the screen covers up a small part of your content. Fantastic, the marble look on the first card is stunning so much depth & texture WOW & those colours are amazing together. Your other card is equally stunning using it for the diects, such a great effect. Thanks for a great video with so much helpful information, do they do smaller gloves ? These are gorgeous cards! I love the effect of your first card. The Hang in There card is so pretty. I love those rose die cuts. So intricate. Great job on the coloring. I love both your cards! Thank you for the tutorial, it was very helpful to see how you made that beautiful background. Lovely cards with beautiful backgrounds!! Wow! the first card is simply stunning! Love the second one too. The new marker refills are really great. They are so versatile! WOW! I love the soft muted color palettes! Amazing cards 🙂 Thanks for the inspiration! These are sooo gorgeous! Love! Hi…..I have been searching…and cannot find where you posted the winner to the Altenew Refresh Your Markers Release Blog Hop. I have looked and looked…..Can you please repost it if you have already posted? Thanks so much…..I love your work….thanks again…have a great day. I’ve searched, too, and can’t find the blog hop winner either! The cards are beautiful, and I just bought the die used in the blog hop. Can’t wait to use it! Same here. It says the winner will be posted Sep 26th. Really great cards and I like your combination of colors for both. Whoever won on this hop, congrats!